This month the International Energy Agency issued a wake-up call to the Renewable Energy sector. With the very welcome success in reducing the cost of solar power and the significant uptick in deploying wind power, renewable energy has earned its recent swagger. It is very much in vogue to expect that the world’s ever-growing energy demand will be satisfied by electrifying everything from cars to heating and even ferries and airplanes. 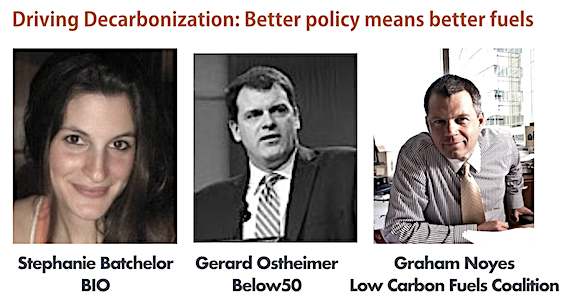 What are the best policy drivers for de-carbonizing transport? Would the policy be “one-size-fits-all” or does it need to be individually tailored? How can we advocate for this policy? Who should advocate for this policy? To answer these questions, we should first consider places where policy is driving de-carbonization of transport further and faster. The one – two punch of the U.S. Renewable Fuel Standard (RFS) and the California Low Carbon Fuel Standard (LCFS) is supporting rapid development and accelerating uptake of virtually all low carbon fuels, including ethanol, biodiesel and renewable diesel. Since 2011, the LCFS has prevented more than 13.7 billion gallons of petroleum from being combusted on the state’s roadways; thereby, reducing carbon pollution by 38 million tons.Given this performance, we believe that California’s policy approach warrants thoughtful consideration. In September, California Governor Jerry Brown hosted the Global Climate Action Summitwith the non-trivial aim of being a “launchpad for deeper worldwide commitments and accelerated action from countries—supported by all sectors of society—that can put the globe on track to prevent dangerous climate change and realize the historic Paris Agreement”. To draw attention to the success of the LCFS in driving emissions reductions from the transportation sector, the California Low Carbon Fuels Coalition (LCFC), the Biotechnology Innovation Organization (BIO) and below50 jointly organized and hosted “Driving Decarbonization”. This event explored the mechanics of the LCFS as well as the way it benefits human health, job creation, and economic growth. Driving Decabonization speakers included Senator Fran Pavley, who was the primary author of California’s climate change programs, Sam Wade who is the lead administrator for the California LCFS and Cory-Ann Wind who is the lead administrator for the Oregon Clean Fuels Program. During the event, stakeholders from industry, government and non-profits from across the U.S. considered how these policy structures could work in their local jurisdictions. The LCFS rewards fuels for reducing their carbon intensity and is technology neutral. In addition to reducing transportation emissions, an intended co-product of the LCFS was to stimulate investment in new LCF biorefineries. Already, California’s program has increased the value of the global clean fuels market by an estimated $2.8 billion. Excitingly, this demand signal is beginning to motiviate investment. 2018 saw five new cutting-edge biorefinery projects move forward, with Fulcrum BioEnergybreaking ground on its municipal solid waste gasification facility, World Energy Paramountannouncing a $350 million expansion of the Paramount facility that is supplying aviation fuel to United Airlines at LAX, Ryzereaching financial closer on two renewable diesel projects in Nevada and the Red Rock Biofuelswood waste biorefinery breaking ground in Lakeview, Oregon. Given this success, carbon-intensity based transportation policy appears increasingly likely in Washington State and is becoming much less far-fetched in the Midwest. In other international jurisdictions, the LCFC is working with BIO, the World Business Council for Sustainable Development’s below50campaign and local stakeholders and organizations to help develop comparable policies. below50 is active in Australia, Brazil, Europe and the U.S. and is promoting CA LCFS-like policies in these countries at both the federal and the state/provincial level. For example, below50 strongly endorsed Brazil’s Renovabio policyand is working to see that policy implemented in a way that generates a strong market signal for low carbon fuels. Next week at ABLC Global the world returns to California to consider the role that the bioeconomy can play in creating a sustainable, renewable carbon economy. Joining the ABLC community and the U.S. DOE will be international experts from numerous international agencies, including the BioFuture Platform. Global Bioenergy Partnership, International Energy Agency (IEA) and the International Renewable Energy Agency. The Bioenergy specific IEA Technical Cooperation Partnership (i.e. IEA Bioenergy) will be holding a full day of technical discussion on how to realize a sustainable, vibrant global bioeconomy. Inevitably, these discussions will lead to calls for policies to realize the potential of the bioeconomy. The ABLC Global participants should look at the carbon-intensity based, technology-agnostic approach of California and ask how this approach can be tailored to their geographies and jurisdictions. To move this discussion forward, the LCFC and below50 and their member companies will highlight California’s approach at ABLC Global. It will be interesting to see which lessons new jurisdictions take from the California experience and how they tailor the carbon-intensity based and technology-agnostic approach to meeting their own carbon emission reduction and sustainable development goals.